He's No Fun, He Fell Right Over! 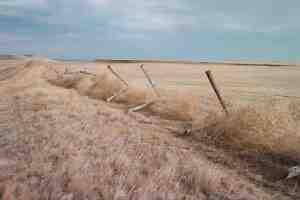 Fences which kept in range cattle for years prove no match for the new hybrid tumbleweeds being raised out here. If the full economic potential of this miracle crop is to be realised, "containment technology" will have to evolve to a higher level.